Beautiful You: Blogmas Day 9 | Costa Christmas Selection! Blogmas Day 9 | Costa Christmas Selection! 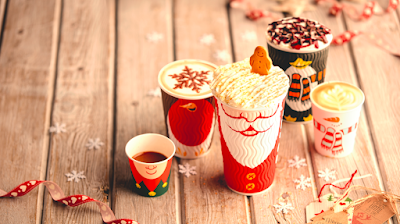 Well if you have been reading my blog for a long time then you will know that I am a massive fan of the festive drinks that coffee shops bring out around this time of the year. This year my favourite selection has to be the one by Costa- yes they win again I know but Starbucks don't do good drinks that aren't coffee. Anyway, I just thought I would share with you my thoughts on what I have tried! I have only tried the Caramel Fudge Hot Chocolate and the White Hot Chocolate from the drinks selection and they are both amazing. The caramel one comes with gold sprinkles and a chocolate lattice on top and it tastes exactly the same as a caramel fudge brownie, this is my favourite out of the two. The white hot chocolate is also really good but this is a bit more sickly than the caramel one, it is supposed to come with cherry sauce on top of the whipped cream but I always ask for caramel sauce instead! This year they've bought out the most amazing festive panini and if you haven't tried it you need to get to Costa right now. It is the pigs in blankets panini and I honestly cannot tell you what makes it so amazing but it tastes so good. It obviously has sausage and bacon in it with spinach, cranberry sauce and stuffing! My sister, our friend and I all went to Costa when they had just bought out their Christmas range and we decided to get three of their seasonal cakes and split them so we could try a bit of them all. The three that we tried were the millionaires tart, the caramel cookie stack and the honeycomb crunch bar- they were all delicious. I would literally recommend any cake from Costa, I don't know how but they are all so yummy, a great treat. Anyway, those are my thoughts on the festive range at Costa. What are you favourite drinks around the seasonal period? Which do you prefer Costa or Starbucks? Let me know in the comments below and also let me know you favourite drink!